Take Alpha-Lipoic Acid 300 by Doctor's Best regularly for improved health! Best Alpha-Lipoic Acid is the best alpha lipoic acid I have ever tried. Will buy again. Works as described in Will Ferris 4 Day diet am very Happy to see the results he promised! 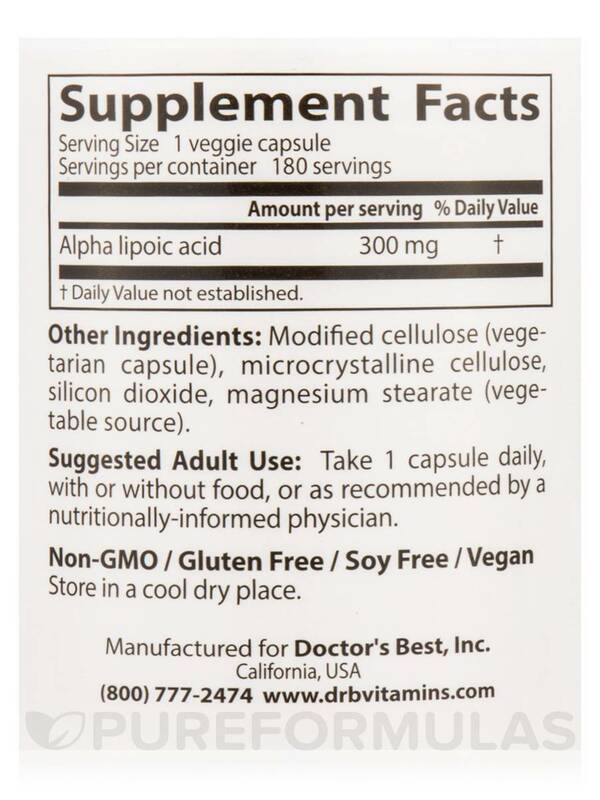 You may boost your body’s cellular energy production by using Best Alpha-Lipoic Veggie Caps from Doctor’s Best®. With its strong antioxidant properties‚ this coenzyme could help negate the damaging effects of free radicals and delay degenerative conditions. It also appears to facilitate glucose metabolism and could help balance glycemic index. 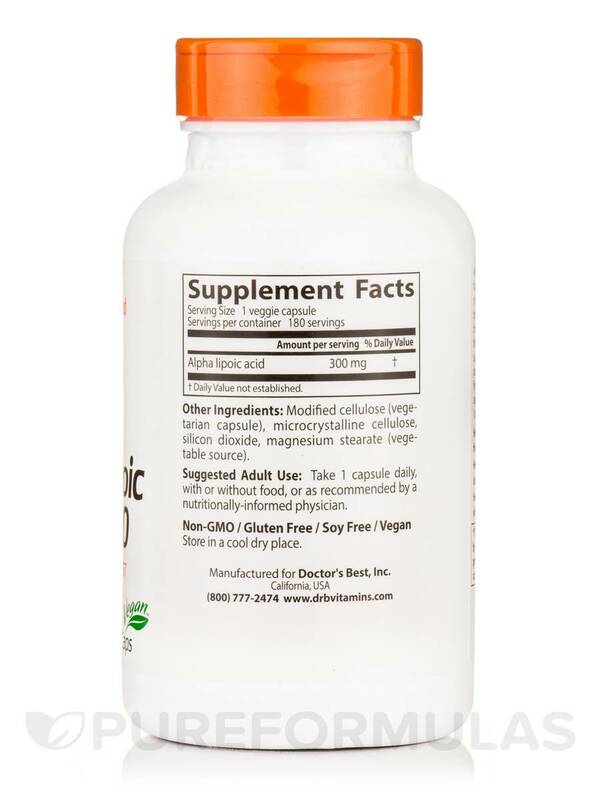 This supplement from Doctor’s Best® is likely effective in recovering and reactivating nutrients like vitamin C and E‚ known for their antioxidant properties‚ and could eliminating against free radicals. Being a universal antioxidant‚ ALA is both water and fat soluble‚ and could effortlessly extend vital protection throughout the body. Studies suggest ALA could alleviate insulin sensitivity and help lower blood sugar levels. It appears to promote brain function by protecting key brain and nerve tissues. New studies suggest that it may also have a positive effect on male reproductive health. 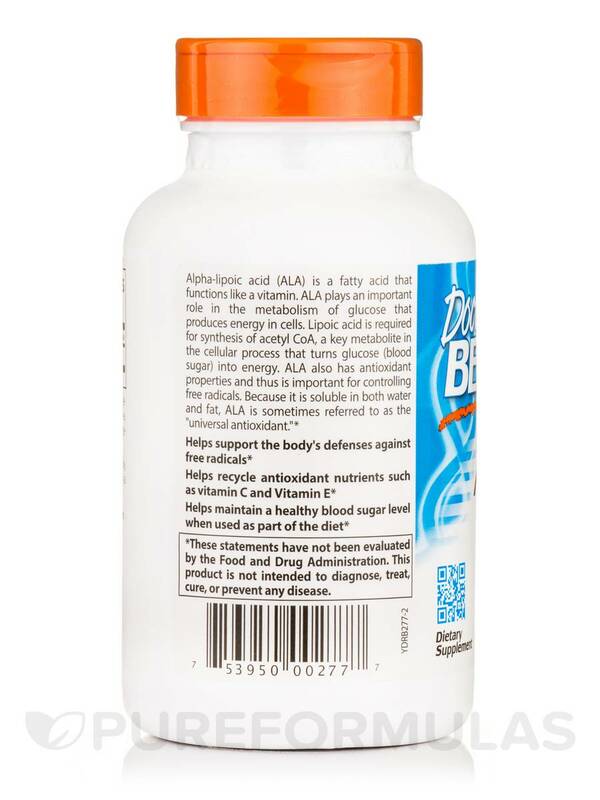 Start taking Best Alpha-Lipoic Acid Veggie Caps from Doctor’s Best® and shield yourself from harmful free radicals. Great product for your overall health ! I've had type-1 diabetes for 29 years, and have used a number of things to help deal with the disease. 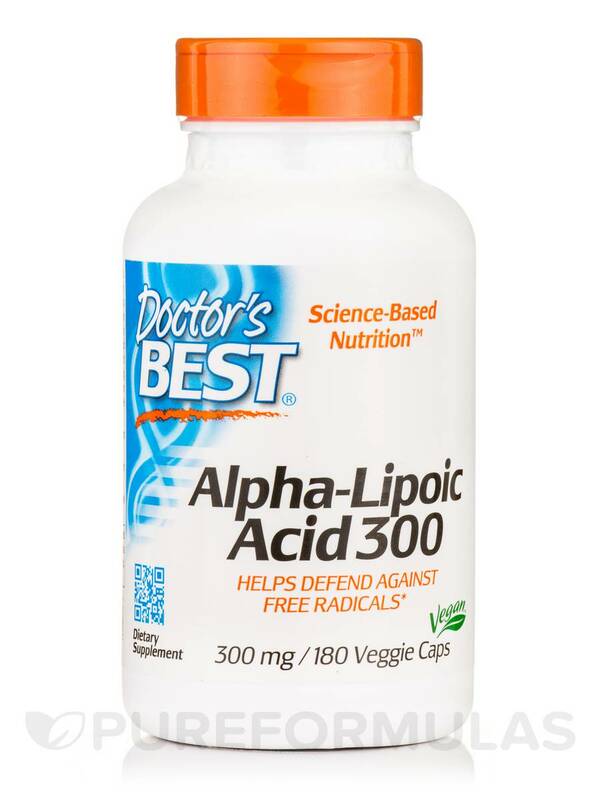 Best Alpha Lipoic Acid by Doctor's Best is a staple, though. I take it 3 times a day, one with each meal. It - along with Gymnema sylvestre and magnesium has been most helpful in keeping my HbA1C in check. The R-form does not seem to lower my glucose levels as much, so I stopped using it. 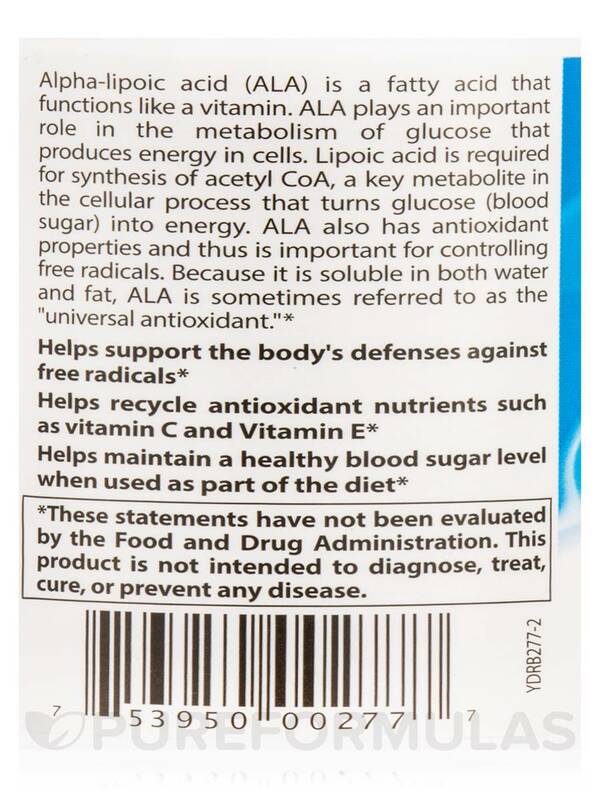 ALA is also a great anti-oxidant, working synergistically with other anti oxidants, and prolonging the effects of Vitamins C & E.
Ive been taking this for some time now and Im feel sure its working. The service and prices here at Pureformulas are really great. Love this company. I have been using Best Alpha-Lipoic Acid on my doctors recommendation for over a year. I find Best Alpha Lipoic Acid 300mg capsules the best of any I have tried and these are vegan. I use Best Alpha-Lipoic Acid along with bacopa to help with my husbands memory. Best Alpha-Lipoic Acid seems to be working. Recommended by my Wellness Clinic! Having experienced a series of unfortunate events my health went so far downhill that I thought I had finally entered "old age" but after being treated by wellness clinic doctors and took the recommended Alpha-Lipoic Acid capsules I feel better than ever!